Winchester Ridge offers a secluded, quiet environment for simple rest and relaxation. The views from the front porch on the top of the ridge offer a 30-mile vista of some of the most beautiful country in Texas. Come to relax and enjoy the scenery, as well as the wildlife. Our modern accommodations (for up to 8 hunters) offers four bedrooms, two full baths, kitchen, dining room, living room and large wrap-around porch. Amenities include a/c, heat, Internet, Fax, Dish TV, VCR / DVD and stereo. Care is taken to ensure that the hunter or visitor is shown the world famous Texas hospitality. 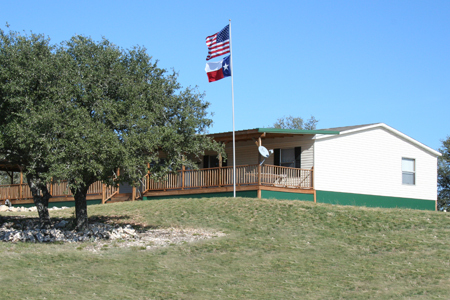 Guests are treated to great Hill Country fare daily and topped off with nightly BBQ around the “liar’s pit”.